One woman is trying to make a difference for the children who live in the middle of Southeast Asia’s biggest landfill, Bantar Gebang in Bekasi, West Java, just two hours outside Jakarta. Resa Boenard moved with her family from West Sumatra to Bantar Gebang when she was 6 years old, a few years before 1989, when the area was turned into a landfill. Today, Bantar Gebang is home to the thousands of tons of trash that Jakarta produces daily and to the around 6,000 familied who spend their days scouring the stinking piles of trash to find anything of value, from plastic bottles to mobile phones, making anywhere from Rp 20,000 (US$1.40) to Rp 100,000 a day from reselling them. This already sizeable community continues to grow as people come from places as far away as Sumatra and Bali to make a living. As Resa knows, growing up in such conditions presents a huge barrier to getting an education. Although she was highly motivated and was able to finish high school, she was constantly bullied by other children because of where she lived. Resa’s life changed forever when a British couple came to visit Bantar Gebang. She connected with them when they realized she could speak English and with their help, she was able to obtain a scholarship to study in the UK and earn a bachelor of information technology from Gunadarma University in Depok, West Java. However, even while she was studying at university, her peers called her "Garbage Princess" after hearing about her in the news. 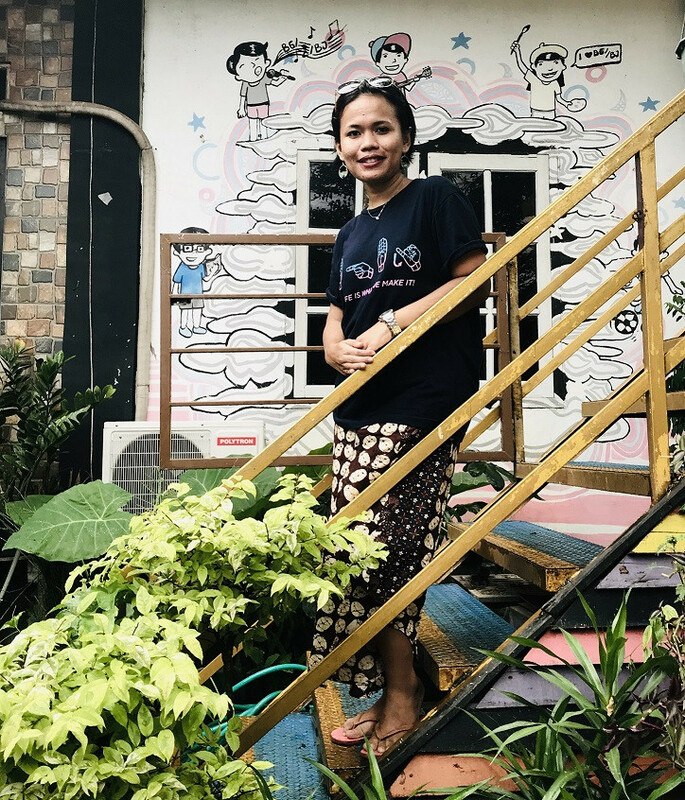 Inspired by her own experience, Resa returned to Bantar Gebang to create the Kingdom of Bantar Gebang Biji or BGBJ (phonetically pronounced "biji-biji"), a tongue-in-cheek reference to her old nickname and which means "seeds of Bantar Gebang". BGBJ is an informal school and hub she established in 2014 with an Australian friend, John Devlin. Every Sunday, BGBJ accommodates anywhere from 30 to 70 children from the local community in a broad range of classes, including English, science, art and yoga. The classes are mainly run on a volunteer basis by visitors staying at BGBJ's hostel, who share their skills and knowledge and in turn, learn a great deal themselves. For many of the children who come to BGBJ, the classes are a welcome break from the days they spend helping their parents make a living as trash pickers. For a few others, BGBJ supplements their classes at a nearby school. The cost of schooling is a barrier for many families here, and public schools also require a student to have an identification card (KTP) for enrolment. Many residents of Bantar Gebang do not have a birth certificate and, therefore, cannot obtain a KTP – or they simply do not want to go through the complicated bureaucratic process of getting one. “We run this place [...] to motivate the children to go to school and study, because they are told by their families, ‘don’t go to school, don’t waste your time, don’t waste your money, it’s better to go to the landfill and earn some money',” said Resa. Resa wanted the children of Bantar Gebang to know that in BGBJ, they had an opportunity to learn new skills so that one day, they could get a better education. Resa also hoped that these children would never lose hope in achieving their dreams. Resa said she could totally relate to the hopelessness that the children often felt because she, like them, grew up in Bantar Gebang, where a lot of her own dreams had been broken. “People kept telling me, ‘Don’t dream too high, Resa, you will get hurt.’ But [this] just motivated me, so that one day I could tell people they were wrong,” she said. Having witnessed the transformation of Bantar Gebang, Resa also tries to raise awareness among the children about the massive scale of Indonesia’s waste problem, and encourages them to do their part to address the issue. “We also teach the children about the environment [and] not to use plastics, so the children bring their own [reusable] lunch boxes and water bottles every Sunday," she said. BGBJ also practices the principle that waste management begins at home. "[Here], we have a very cheap drink called es mangga, but it comes with a straw. So I asked to the seller to only serve [the children] if they brought their own water bottles. It works, but sometimes the seller complains that it’s too complicated. I explained that it [concerns] the mountain [of trash] in front of our homes. Hopefully, we can create a big change for the future from something so small,” she said. Although BGBJ is largely run by volunteers and the money it raises through crowdfunding and selling knick-knacks it makes from upcycled materials, individual donors sometimes come on board to help fund its activities, such as a weekly lunch or a trip to the zoo. However, such donors can be hard to come by and their support is often short-term. Despite this, Resa is not afraid to keep on dreaming big. She is currently seeking a mentor to help her manage BGBJ and eventually expand the community.